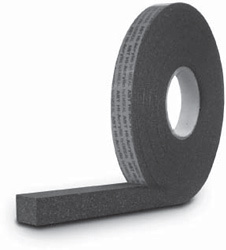 EM-Seal is a self-adhering tape made from resilient, open-cell polyurethane foam. It’s impregnated with a water-based acrylic-modified asphalt emulsion and then compressed to a sealing density level appropriate to the application. Typically, higher compression levels are required for watertightness in water run-off applications; lower compression can be used, for example, for snow seals at roof ridges. EM-Seal replaces and outperforms liquid and butyl-tape sealants as well as closed-cell and unimpregnated open-cell foam closures. Supplied with self-adhesive on one side. Metal roofing is more energy efficient than asphalt roofing.